Is your network ready for May 25, 2018? The GDPR will have a significant impact on data handling operations, not only for organizations operating within the EU, but nearly all organizations receiving and processing data from EU citizens. Moreover, an area of IT that will also be impacted by GDPR is your network monitoring and security infrastructure. 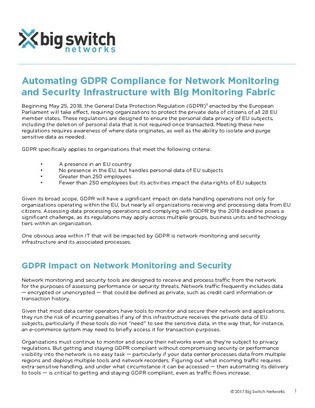 Access this white paper to gain valuable insights into how to leverage Big Monitoring Fabric to reveal the benefits of network visibility for all monitoring and security tools, while simplifying and automating regulatory compliance.